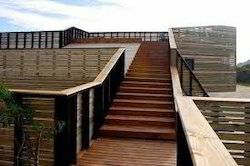 Our company holds vast experience in this domain and is involved in offering External Wooden Staircase. Founded in the year 2014, Kumar Wood Work's & Timber is one of the prestigious names in market. Our ownership type is sole proprietorship. The head office of our company is situated at Bengaluru, Karnataka. We are the foremost manufacturer, wholesaler and retailer of Wood Log, Safety Cabinet, Wooden Door, Wooden Beading and Wooden Staircase. Offered products have sturdy construction.